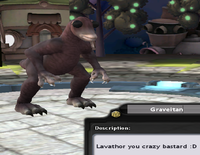 So been playing spore, and here is my challenge. Start either on cell or creature stage. At each levelup (when your brain gets bigger ect...) You can mate and replace or add 1 item and remove 1 item. No more. Let me know what you get and come up with. 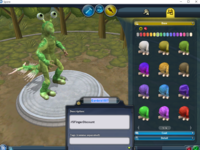 Spore's creative freedom is the only thing that gets people through the actual gameplay. Unless it's something really novel (playing everything as a tiny maggot!) a challenge that takes away that freedom isn't going to be very fun. Depends on who you are. I did the challenge and thought it was pretty fun. *puts on sunglasses* Challenge Accepted. Play in windowed, then take a screen shot if your computer, open paint, paste picture ( right click, paste) save the upload. I'm halfway through the challenege, I'm taking a picture at each st3p. Easy!! just mate immediately after hatching!! No, he said you could only mate every time you went up a brain size. So three times in the creature stage, plus one more in the transition to tribal. I'm mostly through creature stage and here is what I have so far. I did cheat once, but I'm going to rule it okay (since I did make the rules). When adding arms/legs, you may also switch out the hands/feet. Dang, that looks super creepy. I like the description as well. I've decided for Tribal mode, that I can add/replace 1 piece for each tribe I "take over" plus 1 to start with. Could not find the edit button on my phone. So I got stuck in tribal and had to restart. However I've altered the rules. Rule 3: you may remove, alter/move, adjust parts as you wosh. Rule 4: when adding legs/arms you may also replace the hands/feet. That's a pretty rockin cell. Okay beat through creature stage here is a gif of my guy.